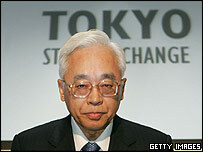 A simple typing error has triggered mayhem on the Tokyo stock exchange and cost one bank £190m. But in a world where almost everyone now is expected to type, how many of us really can? "Where's the 'P' gone... who's stolen the 'P'?" Think back to those initial days when you made the leap from pen and exercise book to the infinitely more sophisticated keyboard, and how bewildering the jumble of keys seemed to be under your ill-guided fingers. The "P", tucked away in the upper-right-hand reaches of the keyboard always seemed particularly aloof. But in time the apparently random distribution of letters, numbers, punctuation and other function keys fell into place. The Qwerty layout was developed in the late 18th Century not to ease the flight of the touch typist's nimble digits, but the opposite. It was designed to slow her - and in those days it was almost exclusively women who carried out secretarial duties - down and prevent a typewriter's clunky typebars from getting jammed. It's ironic then that today, in an era when lightning-fast computers are de rigueur and typing is no longer the preserve of skilled secretaries, but expected of just about everyone, that the Qwerty layout has never been more widespread. Its popularity, however, is less certain, particularly among those who've been at the sharp end of an embarrassing "fat fingers" incident - the term given to a simple typing error caused by hitting the wrong key. It happens millions of times a day, but once in a while the result can be devastating. Earlier this month a trader on the Tokyo stock market accidentally blew £190m because of a simple typing error. A computer which should have cancelled the transaction failed to click in, and this further embarrassment led to the resignation on Tuesday of the head of the Tokyo stock exchange. In March this year the Sudanese government was irked to read on a US Congress website that America had carried out nuclear tests in Sudan in the 1960s. Fears were allayed however when it turned out to be a typing error. The report should have said Sedan - a test site in Nevada. Occasionally, such errors can even play into the hands of ordinary folk - such as when online traders accidentally under-price a product. Mostly, though the clumsy two-fingered typist has little to smile about compared to his or her infinitely faster and more accurate touch-typing colleague. Anecdotal evidence suggests not only are "hunt and peck" typists less efficient, they are also more likely to suffer an industrial injury. "As more and more people are getting computers at their desks we are becoming a nation of two fingered typists," said the TUC general secretary Brendan Barber this year. "While you can become quite proficient without typing properly, you are putting yourself at serious risk of developing RSI." Part of the problem rests with perceptions, says Sue Westwood, who is campaigning for touch-typing to be taught to children. "In schools we still get comments about it being a secretarial skill and the 'less able' children will make use of it." 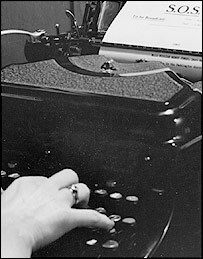 She compares two-fingered key bashing to "like trying to write with a quill and a pot of ink, because you've got to keep stopping to look up at the screen." In the eyes of John Sutherland, an English professor at University College London, "tough guys don't touch type". His words are meant as caricature. One of the initial problems in selling computers was getting men to touch the keyboard, he says. 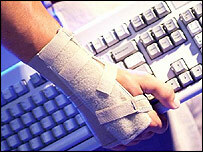 Having got over that phobia, many are reluctant to see typing as a skill, to be learned. In fact, hunt and peck typists have always been around. The iconic American journalist HL Mencken suffered not a bit from "writing ceaselessly using a staccato two-fingered typing process that made him look like a bear cub imitating a drum majorette" - to quote his biographer Terry Teachout. But times have moved on, and the question for many now is not whether to learn, but how best to learn. French man Daniel Guermuer has a novel approach. He tried some traditional typing courses without any luck, before hitting on the idea of scrubbing all the letters from his keyboard; effectively typing blind. "It's analogous to a piano - there are no marking on piano keys, you just have to learn them," he says. It did the trick and earlier this year M Guermuer began selling blank keyboards for others who want to learn, under the brand Das Keyboard. "You go through two weeks of pain. In the first week your typing slows greatly, but by the end of week two you are touch typing," says M Guermuer. Journalists who have tried the keyboard have reported some success with it. But it's tempting to get things out of hand. Millions of people find the hunt and peck method adequate, some even reporting speeds of up to 60 words per minute. As Alan Knifton, of Pitman Training, acknowledges, "if you don't do a lot of typing, the two-fingered approach is probably sufficient". Just so long as you can remember where that errant "P" went.